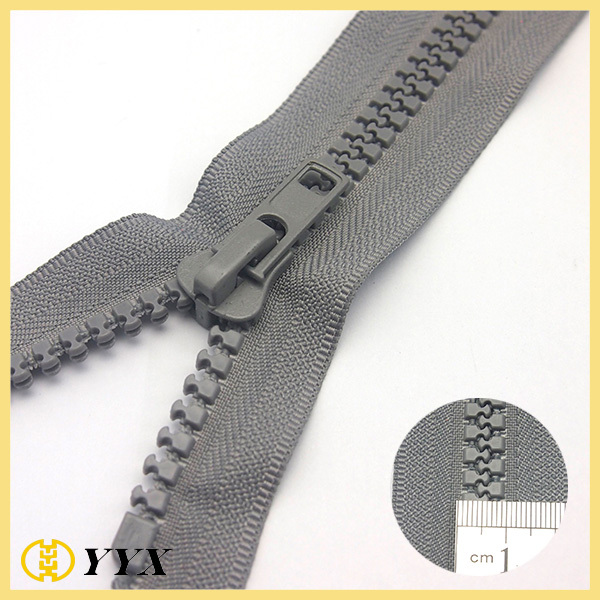 Product categories of Plastic Zipper, we are specialized manufacturers from China, Plastic Zipper, Long Chain Continuous Plastic Zipper suppliers/factory, wholesale high-quality products of Colorful Plastic Zipper R & D and manufacturing, we have the perfect after-sales service and technical support. Look forward to your cooperation! Plastic zipper is a zipper, plastic teeth with polyester rice by color and by dye injection molding machine drain out. According to the material zipper, zipper into three categories: Metal Zipper, Nylon Zipper, Plastic zipper. Metal zipper teeth is made of copper or aluminum row by row of teeth out of the machine, nylon zipper teeth are made of nylon monofilament wound centerline composition by heating the die, the plastic is a polyester plastic zipper teeth by dye color and through rice injection molding machine out of the row. 1. Resin zipper can be used in all kinds of occasions, but generally prefer to use in clothing pockets. 2. The common fastener head is painted, sometimes used plating. 3. acetal copolymer resin zipper is the main material, the cost of one nylon zipper and metal zipper in the middle, kind of zipper durability than metal zipper and nylon zipper good. 1, must be closely linked to the microphone on the microphone clamp tooth or teeth, must ensure that its robust and down a perfect ending. 2, resin zipper slider options: modeling resin zipper pull more, finished either small detail to be rough magnificent. But no matter what kind of slider, slider have to feel comfortable pull start whether, or not on the zipper pull Bulong phenomenon will not occur. Now available in the market resin slider comes with self-locking device, so after zip, get after the next test whether the lock fixed zipper will slide down. 3, tape selection: As raw material resin zipper tape is polyester yarn, thread, SMIC and other different types of silk thread, whose components have different coloring, so on the same color zipper prone in this case when you select to choose even dyeing cloth tape, no turbidity point, cloth made with different fabrics are soft to the touch-based. 4. Select the microphone teeth: resin zipper teeth are also metal plating color microphone, so care must be taken when choosing color plated surface is uniform, there is no phenomenon of flower color, is smooth zipper pull up and down. Zipper pull together, you must observe about whether teeth are meshing with each other, asymmetrical zipper teeth will certainly affect the use of the zipper.